This article is about a broadcaster. For other uses, see TVB (disambiguation). TVB Jade, TVB Pearl, TVB Anywhere, MyTV Super, TVBS, TVB.com, TVB Publishing, etc. The main TVB transmitter at Temple Hill. TVB was Hong Kong's first wireless television station. The government set up a working party in the early 1960s to study the idea of setting up a second television station in Hong Kong, where the only television at that time was the wired, subscription-supported Rediffusion Television. There was debate as to whether the second station should be set up as a Crown corporation, as with the BBC; a purely commercial enterprise; or a combination of the two. Another challenge lay in procuring enough content for the new station. In 1962, Director of Information Services J.L. Murray stated that while English programming could be purchased from other countries, "no country is producing a mass of suitable pre-recorded material in Chinese". Even though Hong Kong was already regarded as a centre for film production, it was considered a challenge to source enough Chinese language content for another television station, as most of it would need to be produced in Hong Kong. Regardless, there was commercial interest in the concept. A government franchise for a new wireless television station was opened for tenders on 6 February 1965 and closed on 6 August 1965. On 25 January 1966 it was announced that Television Broadcasts Limited had won the franchise. The new Television Broadcasts Limited station on Broadcast Drive in Kowloon Tong, Kowloon was officially opened by Governor David Trench on 19 November 1967. The governor spoke of the potential for television to better society, stating that the new station would play a significant role in "helping and enlighting our people", calling television "one of the most potent means of disseminating information there is". The first images shown on the station were a live transmission of the Macao Grand Prix, which began broadcasting at 9:00 am that day and was interrupted by footage of the opening of the new station. The first colour broadcast was then made, a feature called "London Calling Hongkong" which constituted greetings from former governors Alexander Grantham and Robert Black. Following this was a piano recital by Chiu Yee-ha, who had also performed at the opening of the Hong Kong City Hall. The new station broadcast both Chinese-language and English-language channels. The Chinese channel, called TVB Jade, began regular service on 4:30 pm that day on Channel 21, while the English service (TVB Pearl) began at 6:00 pm on Channel 25. The inaugural programming lineup included Enjoy Yourself Tonight, a Chinese language variety show, and Meet The Press, an English current affairs programme. Hong Kong's mountainous topography posed a challenge to TVB, which was Hong Kong's first television station broadcast wirelessly. A network of transmitters, built atop various mountains, helped provide coverage to the territory. 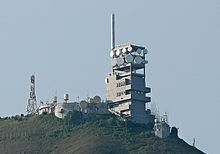 The main transmitter was built at Temple Hill, above Kowloon, to reach most of the main populated centre of Hong Kong as well as parts of the New Territories. Two broadcast relay stations were came into operation on 15 May 1968: one at Lamma Island expanded coverage to Pok Fu Lam, Aberdeen, Repulse Bay, and parts of Stanley, while another at Castle Peak covered Tuen Mun, Yuen Long, and Ping Shan. A third booster station, located on Cloudy Hill, was activated in June 1968 and brought TVB reception to Fanling, Taipo, and Sheung Shui. TVB receives praise for its programming from a wide range of demographics, including the middle class, as was the case with its 2004 historical drama series War and Beauty. Its programme line-up features a steady stream of soap operas, variety shows and other populist fare. TVB has been criticised for signing exclusive contracts with many local celebrities which restrict them from appearing on other local television stations. Hong Kong's Cable T.V. claims it is unfair competition (although Asia Television, another major television station in Hong Kong, disagrees). In fact, many artists do not have exclusive contracts with TVB and are free to show up in programmes produced by other local television stations or out-sourcing production houses. The annual TVB Music Awards ceremony is one of the biggest for Cantopop personalities. It is widely rumoured that TVB distributes the awards to those who are obedient to the company's demands, and the Independent Commission Against Corruption has investigated the arrangement of the awards. It ruled that three TVB staff members under scrutiny were not guilty. Afterwards, TVB reformed its music programmes in a bid to reestablish their authority. On the other hand, TVB was awarded the National Association of Broadcasters's (NAB) International Broadcasting Excellence Award in 2001. The award recognised the company's outstanding contributions to the community through a wide range of charitable programmes and activities. Hong Kong thus becomes the first city in Asia to receive this prestigious award in this area. In 2005, TVB, in association with the Hong Kong Jockey Club, organised the biggest fund-raising campaign in the company's history in response to South-East Asia's devastating tsunami. It raised over one hundred million Hong Kong Dollars to assist those affected. In 2000, TVB Australia was established for the Australian market with a 17 channel (14 Chinese and 3 Vietnamese Channel) satellite service. Which has over 25,000 households and over 1,500 commercial outlets with an audience of over 130,000 daily. From 31 March 2008, TVBS-Europe launched their "Multi-channel" package in Europe. It consists of 5 different channels which include the existing TVBS-Europe Channel plus the addition of TVBN, TVB Entertainment News, TVB Classic and TVB Lifestyle. TVB was originally located on Broadcast Drive in Kowloon Tong, and was neighbours with RTHK and ATV. By the late 1980s, the company had out-grown the facility at Broadcast Drive, and built a new studio complex, named T.V. City, at 220 Clear Water Bay Road in November 1988. The first TVB City was in fact the old Shaw Movie Town complex used by Shaw Brothers since 1958. The old Broadcast Drive headquarters was later converted into apartments. The first TVB City is now used by Celestial Pictures. To cope with future development and expansion, TVB began planning in 1998 to develop a replacement facility at the Tseung Kwan O Industrial Estate. The new HK$2.2 billion TVB City came into full operation in October 2003. The new headquarters are built on by far the largest piece of land ever leased by the then Hong Kong Industrial Estates Corporation and the first service-providing company in the area. It has a building area of over 110,000 square metres, 30% more than that of the previous facilities at Clear Water Bay. Studio 1 in TVB City, which can seat an audience of six hundred and thirty, is the largest television production studio among commercial television stations in Asia. TVB broadcasts several news programmes, such as News at 6:30 (Jade) and News at 7:30 (Pearl). It also operates its own news channel, TVBN. (Chinese: TVB新聞台; Cantonese Yale: TVB san man toi) and TVBN2 (Chinese: TVB新聞2台; Cantonese Yale: TVB san man ji toi), through TVB Network Vision (Chinese: 無綫網絡電視; Cantonese Yale: mou sin sau fai din si). Enjoy Yourself Tonight or EYT (1967–1994), a long-running variety show which has been compared with the American Saturday Night Live. The Bund (1980), starring Chow Yun-fat. The drama was a success throughout Asia, inspiring several television and film adaptations. The Legend of the Condor Heroes (1983), a serial adaptation of Louis Cha's wuxia novel of the same name, starring Felix Wong and Barbara Yung. The Return of the Condor Heroes (1983), sequel to The Legend of the Condor Heroes, is a serial adaptation of Louis Cha's wuxia novel of the same name, starring Andy Lau and Idy Chan. Looking Back in Anger (1989), is a tragic serial drama starring Felix Wong, Deric Wan, and Carina Lau. It is the most-watched Hong Kong drama in the Greater China region. The Greed of Man (1992), starring Adam Cheng and Sean Lau. Its original broadcast heavily impacted international stockbrokers, creating the phenomenon known as the Ting Hai effect. The File of Justice series (1992–1997) was a popular legal drama series, spanning five seasons. It is regarded by some as the Hong Kong version of the American Law & Order. A Kindred Spirit (1995–1999), the second longest-running drama series in Hong Kong television history. Super Trio Series (1995–present), a popular variety game show. Journey to the West (1996) was one of the few TVB Jade programmes to be dubbed in English and rebroadcast on TVB Pearl. Old Time Buddy (1997), a comedy-drama that satires Hong Kong's filming industry in the 1960s. It was the first drama to win "Best Drama" at the inaugural TVB Anniversary Awards. Secret of the Heart (1998), a soap opera that popularised relationship triangles in serial dramas. The Armed Reaction series (1998–2004) was a popular crime drama series dealing with discrimination women face within the police force. The series spanned four seasons. The Healing Hands series (1998–2005) was a popular medical drama series known for its remarkable medical accuracy. It is commonly known as Hong Kong's version of America's ER. The first season yielded "Best Drama" award in 1998. At the Threshold of an Era (1999–2000) is an epic drama featuring a large ensemble cast. It is TVB's second most expensive drama to date. War of the Genders (2000), a sitcom starring Carol Cheng and Dayo Wong, is considered by many as TVB's most critically acclaimed sitcom. It held the title as TVB's highest-rated drama (49 points) until the broadcast of Korea's Jewel in the Palace in 2005. Cheng won "Best Actress" for her role. Virtues of Harmony (2001–2005) is one of the longest running sitcoms in Hong Kong, yielding two seasons – a historical costume series with a modern-day spin-off. Square Pegs (2003), a drama serial starring Roger Kwok, depicts the life of a mentally-retarded young man. It received an average viewership rating of 37 points, the highest in TVB's broadcast history. Kwok also won "Best Actor" for his role. A second series was released in 2005, yielding Kwok his second "Best Actor" award. Triumph in the Skies (2003) and Triumph in the Skies II (2013), a drama series revolving around the staff and pilots working for Solar Airways, a fictional version of Cathay Pacific. Triumph in the Skies was also adapted into a motion picture. War and Beauty (2004), a costume drama serial that focuses on four concubines of the Jiaqing Emperor. The series popularised historical palace harem dramas. Moonlight Resonance (2008), the sister production of Heart of Greed (2007). The drama peaked to 50 points, one of the highest in Hong Kong television history. EU (2009), the third season of The Academy series. Michael Tse's character, Laughing Gor, inspired one film spin-off and one sequel television series. Rosy Business (2009), award-winning costume drama, swept the 2009 TVB Anniversary Awards in almost all major categories. Beyond the Realm of Conscience (2009), a costume period drama that peaked to 50 points, one of the highest in Hong Kong television history. When Heaven Burns (2011), "Best Drama" winner at the 2012 TVB Anniversary Awards. Despite its critical acclaim, it is one of the lowest-rated series in television history. The last few episodes were also banned in Mainland China due to references of the Tiananmen Square protests of 1989. Line Walker (2014), a crime drama that spawned one film sequel and a television series prequel. It is the most-viewed Hong Kong drama in Mainland China, with over 2 billion views on Youku. A Fist Within Four Walls (2016), a martial arts drama set in Kowloon Walled City that won Best TVB Drama at all the award presentations, with many of the cast from A Fist Within Four Walls winning awards. It swept the TVB 2016 Award Presentation with 5 awards: My Favourite TVB Female Character, My Favourite TVB Male Character, Best Actor, Best Actress, and Best Drama Series. On 11 March 2010, the general manager Stephen Chan Chi Wan and four others were arrested on corruption charges by the Independent Commission Against Corruption (ICAC). TVB confirmed that three of their employees were involved, and that their duties and work had been suspended pending further development. Stephen Chan Chi Wan was charged with corruption in September 2010 with TVB declining to comment on the situation. Stephen Chan and his co-accused were acquitted by a court in September 2011. TVB Network Vision ceased its service since 1 June 2017, and the OTT platform named MyTV SUPER (expanded from MyTV and GOTV) replace TVB Network Vision to provide the paid television service. In addition, the company name of "TVB Network Vision" became "Big Big Channel". ^ "When Hong Kong was a colour TV pioneer, 26 November 2016 , Post Magazine". Retrieved 23 January 2018. ^ Chow, Vivienne (29 March 2015). "Wong Ching, the leading man in ATV's sorry drama". South China Morning Post. Retrieved 3 April 2015. ^ "Farewell ATV as its survival fight ends". The Standard. Retrieved 11 April 2016. ^ "ATV, World's Oldest Chinese TV Channel, Closes Down". Variety. Retrieved 11 April 2016. ^ "Possibility of new T.V. station in Hongkong". South China Morning Post. 7 June 1962. p. 1. ^ "Wireless TV franchise". South China Morning Post. 26 January 1966. p. 1. ^ a b c "Governor opens television station: Stresses importance of enlightening people". South China Morning Post. 20 November 1967. p. 6. ^ "Gift for first baby born on Sunday". South China Morning Post. 15 November 1967. p. 7. ^ "HK-TVB building booster transmitters". South China Morning Post. 16 February 1968. p. 7. ^ "Wide coverage of HK-TVB's translators". South China Morning Post. 29 June 1968. p. 16. ^ "New translator station". South China Morning Post. 4 June 1968. p. 5. ^ "舞影行動終止　何麗全曾國強陳家倫慶清白" (in Chinese). 金羊網. 21 January 2005. Retrieved 11 June 2007. ^ "NAB International Broadcasting Excellence Award". National Association of Broadcasters. Archived from the original on 8 November 2008. Retrieved 9 June 2008. ^ "Grand Opening of Television Broadcasts Limited's TVB City A Significant Milestone of the Broadcasting and Production Industry in Hong Kong". TVB. 10 December 2003. Retrieved 6 November 2007. ^ MAK, Adrian Yau Kee (11 March 2010). "Announcement" (PDF). Television Broadcasts Limited. Retrieved 12 March 2010. ^ "TVB boss cleared in corruption case". RTHK. 2 September 2011. Retrieved 7 May 2012. "List of Directors and their Roles and Functions announced on 20 May 2015" (PDF). TVB. Retrieved 4 January 2017.